It’s Wednesday and that means a special post for all you writers out there. Woohoo! Lately I’ve been enjoying the wit of comedian Jim Gaffigan. He’s clean and several of his routines are on Netflix, which is a double bonus for those like me that need something funny to unwind to after a long day and can’t exactly head out to a club. Babysitters are expensive. Once of Jim’s signature elements in his routine is that he will insert his own criticisms into the flow of the joke. You know it’s coming because he turns to the side and impersonates a generic grandma from the audience, I imagine his mother. It is these asides that make his routines unique and even funnier than if he did a straight up routine. It is also a brilliant way to draw more attention to the joke itself and make it even funnier. While watching, it got me thinking about using “flags” to point out things in a story that are either out of character or perhaps a little strange for your world. It’s for when you break one of your own rules in your world, you need to “hang a flag” on it to ensure your reader knows that you are aware you just broke one of your own rules. I’m not talking about the laws of the land. When we hang flags it’s more to show a break from the normal for that world or that character. Say your character always orders a cheeseburger when they go out and then out of the blue gets the chicken sandwich. That would merit a flag, something should be said to explain the break in the norm. Maybe he’s going through a break up and they ate cheeseburgers on their first date. Maybe he’s found out that his cholesterol is out of control. Maybe the last time he ate a cheeseburger he found a dirty band-aid under the patty. If we didn’t say something about the change in the norm we’d be missing out on giving that character a little extra depth. Flagging is for intentional rule breaks. If a rule is set in a world and unintentionally broken it needs to be fixed. Often it is a way to inject humor or to push a plot point in a different direction. The moral of the story is that if you are going to have rules in your world or for your characters and you find that you have to break those rules, you have to either point it out or fix it. 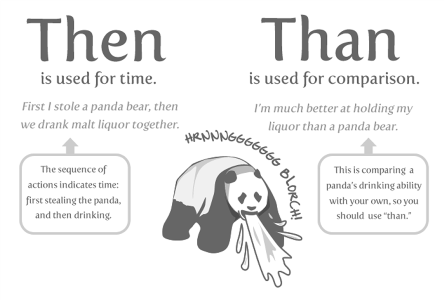 It’s Writer Wednesday here and today we will tackle a mini grammar concept – the difference between then and than. These writing themed posts used to be the weekly mainstay of my other blog, My Literary Quest, but will now be hosted here and reblogged there. Then can be used as three different parts of speech, which is probably why it gets mixed up so often with than. The main use of then is as an adverb, specifically to situate an action in time. For example, she attended English class and then went to lunch. It’s also part of the if … then construction –If you clean your room, then I will tell you my secret. Then can also be used as a noun meaning that time. (e.g., “I wanted to scream, but then was not the time.” To me this sounds a bit clunky and dated, but it’s a valid use. The last use of then is as an adjective, meaning at that time. This usage is the most awkward of all, but I have seen it used at times. Her then apartment was full of ants. Of note – both of the last two uses of then are passive voice. If you catch yourself using them in fiction you might want to carefully consider if that’s your best option. Everyone still following along? Great! Moving on to than. Pop quiz! Write down your answers and see how you do. There is nothing better (then/than) choosing to “like” this post. If you can breathe, (then/than) you can share this blog with a friend. The (then/than) Prime Minister of the UK would like this blog because it talks about Doctor Who from time to time. Read the post first, (then/than) leave a brilliant comment. I personally would rather be eating chocolate (then/than) taking a silly grammar quiz. If you would like to go sneak some chocolate (then/than) go do it, I won’t judge. Get all six right? Woohoo! You are a grammar ninja! Didn’t? It’s ok, try and try again! Want to see more Grammarland posts? Check out the whole collection at this link! Welcome to writer Wednesday! Here we will tackle topics of interest to fellow writers and hopefully be interesting to readers of fiction. These posts used to be written over at My Literary Quest but now will be featured here and reblogged there. Today we will discuss the literary genre, magical realism. Although it feels like the term “Magical Realism” is fairly new, it has actually been around since the 1920s. As a fantasy writer myself, I wanted to explore this term to better understand it. The idea of magical realism sprang up first from a German art critic, Franz Roh, who used it to describe art that pushed beyond the surreal, creating intriguing, thought provoking works. This art was known for it’s photographic clarity and focused on the magical nature of the real world. This art inspired writers to find the same feeling in their works. They aimed to capture the fantastic, mysterious nature of reality. These writers carried these ideas over to Hispanic America where it was embraced and began to evolve. The term “marvelous realism” was born and described works that presented a realistic and pragmatic view of reality that includes an acceptance of the existence of magic and superstition. This is closer to how we define magical realism today. The 1955 essay by critic Angel Flores titled, “Magical Realism in Spanish American Fiction” combines both aspects of magic realism and marvelous realism and brought the genre back to life after it had gone out of style. This increase of interest led to the term magical realism being applied to a new type of literature known for a matter-of-fact portrayal of magical events. Today, magical realism is alive and well and is probably in more places than you’ve imagined. Popular novels that are considered to fall in this category include: Like Water for Chocolate by Laura Esquivel, Love in the Time of Cholera and One Hundred Years of Solitude by Gabriel Garcia Marquez, Beloved by Toni Morrison, and Midnight’s Children by Salman Rushdie. Authorial reticence, meaning that the author withholds explanations about fantastic events, treating them as if nothing extraordinary has taken place. Plentitude, referring to an almost Baroque feel where there is an abundance of disorienting details. Hybridity, where plot lines evolve along multiple planes of reality. Metafiction, where the book acknowledges the existence of its reader. Heightened awareness of mystery, the story isn’t bound to the rules of conventional exposition and pushes for a heightened state of awareness of life’s hidden meanings. Political critique. Due to its foothold in the real world, magical realism is better suited to criticize society, especially the elite. Final question – is magical realism the same as fantasy? Yes and no. It depends on how fantasy is defined. Fantasy that takes place on bizarre or alternate worlds is not magical realism. However, urban fantasy can be considered magical realism if the magical elements are known and accepted in the world. Most agreed that epic fantasy is not magical realism due to the universal existence of an alternate world. That said – the famous Terry Prachett is quoted saying magical realism “is like a polite way of saying you write fantasy.” Although in my opinion, his writing largely embraces the chief tenet of magical realism where the most fantastic elements are taken as normal, or even mundane. I say magical realism is different, largely because the overall feeling of the work is distinct. Fantasy puts magic on a pedestal and glorifies it, magical realism shoves it under the rug as it explores other aspects of life. What do you think? Do you write magical realism? Let’s talk about it in the comments!